After a sojourn in the Old West with True Grit, the Coen brothers returned to the 1960s for their latest. But the pre-Kennedy assassination, West Village–set Inside Llewyn Davis is about as different from the suburban Minneapolis-set A Serious Man as a movie made within five years by the same filmmakers can be. Oscar Isaac plays the titular Llewyn, and to describe him as a “struggling” folk artist is a drastic understatement. He’s effectively homeless, surfing the couches of the few friends he hasn’t alienated, wandering from gig to begged, poorly paid gig in the middle of winter with nothing but a corduroy blazer on top of what seems to be his only change of clothes, and I guess it says something about my middle-class squareness that I couldn’t help noting we never see him launder anything. 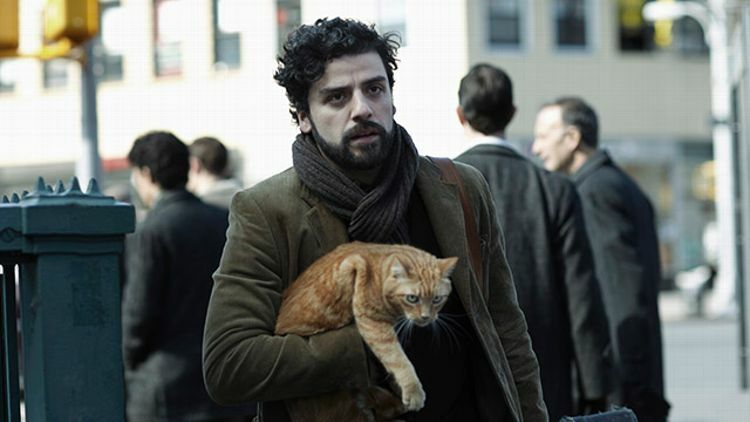 The point is that things are not that great to begin with for old Llewyn even before he finds out that Jean (Carey Mulligan), a fellow folk singer married to one of his friends, is pregnant from a recent assignation with Llewyn, and she needs him to come up, somehow, with the money for her to get an abortion. Llewyn is not quite a scumbag, but he is mostly heedless and selfish, and over the course of the week the film portrays, he is — seemingly for the first time — made to understand how his actions (and inactions) can hurt the people unfortunate enough to cross his path. He’s kind of a bad person, but he is a good musician, and the music is a pleasure. The male members of the cast — including Garrett Hedlund, John Goodman, Adam Driver, and an enjoyably dorky Justin Timberlake — do nice work, and as for Mulligan … well, I hope the Coens remember how to write female characters who aren’t relentless shrews in time for whatever their next film turns out to be. It’s been seven years since we last checked in on the adventures of Veronica Mars (Kristen Bell), girl detective and (apparently) the smartest person in all of Neptune, California. Since then, she’s moved about as far from Neptune as one can — to New York City, where she’s working as a lawyer and dating Piz (Chris Lowell). But there wouldn’t be a movie if there wasn’t a pretext for her to hook back up with all her old high school frenemies. To wit: Her ex-boyfriend Logan (Jason Dohring) has been accused of murdering his girlfriend, and Veronica’s going to have to get him off, PROBABLY IN MORE WAYS THAN ONE, WINK. Veronica Mars — also out in (selected) theaters today — joins Serenity in the annals of Movies Based on Remarkably Low-Rated TV Series. The difference, as we all know by now, is that this one is literally fan service: The budget was raised on Kickstarter, in a record-setting campaign that helped launch the crowd-funding site into the mainstream. So if you believe in the democratization of the development process, definitely give this one a rent. How many more movies will Jason Statham make in which he plays a super-cut tough guy who lives among rednecks yet inexplicably has a cockney accent? Who knows, but this is the latest. In this one, Statham is Phil Broker, a salt-of-the-earth cockney DEA agent who runs afoul of a meth kingpin played by James Franco. And I know it’s all just movie magic and also that no one’s on the meth kingpin’s side (at least, not since Breaking Bad ended), but Statham better not do anything to mess up Franco’s pretty face. Bale plays Russell, a steel mill worker whose Iraq War veteran brother Rodney (Casey Affleck) can’t help getting into trouble and pulling Russell down with him. Though, it isn’t exactly Rodney’s fault that when Russell goes to a bookie to plead for debt relief on Rodney’s behalf, Russell then drives drunk and gets into a car accident. Russell ends up in prison, but after serving his time, Rodney’s various activities — including illegal fights — don’t make Russell’s life on the outside any easier. I really want to like Olivia Wilde. She’s very pretty. She seems smart. Jason Sudeikis put a baby in her, and his many seasons b-boy dancing in a red Adidas tracksuit during “What Up With That?” has given him a lifetime pass with me. But she needs to quit playing homewreckers. Better Living Through Chemistry, which is available on demand simultaneously with its theatrical release, features Wilde as a bored small-town trophy wife whose encounter with the married, cowed local pharmacist (Sam Rockwell) leads to an affair fueled by pills from the drugstore where he works. And then, from there, to a plot to murder her husband (Ray Liotta), because where else could it go? The Face of Love, out on VOD the same day as its theatrical release, probably would have attracted its target white wine–drinking female audience even if it were just the story of AARP-eligible characters spending classy evenings in their beautiful Los Angeles homes, as in Enough Said or The Kids Are All Right or … well, It’s Complicated was set in Santa Barbara, but close enough. However: There’s a twist! Annette Bening plays Nikki, still grieving the loss of her husband, Garrett, five years before we meet her here. Her world is rocked, however, when she visits a museum and chances upon Tom (Ed Harris), who looks identical to her late husband. His giving her private art lessons at home soon progresses to the bedroom, and honestly, who could blame either one of them. But given that she’s lied to Tom about what happened to her husband AND that she can’t introduce him to anyone who knew Garrett (for obvious reasons), can this relationship actually work?